Five years ago today, Dr Lars Svensson of the Cleveland Clinic and his surgical team sawed open my chest, and performed two operations at the same time. They repaired what would have become a life-threatening aortic aneurysm, and replaced the mechanical aortic valve, which had ceased to function optimally with a bovine tissue valve. Six weeks earlier, as President of the World Union for Progressive Judaism, I conducted worship for Yom Kippur at the Reform synagogue in Prague. Later that evening, as my soul glowed from my efforts on that marathon day of prayer and teaching, the World Union Board Chair called to fire me. Although the call was not a surprise, I was devastated. For eighteen months I had traveled the world speaking and teaching on behalf of the World Union. I had never worked so hard in my life. At the time of my surgery I was at low ebb. I was weak as a kitten I did not know whether I would live or what I would do if I did. Vickie, of course, came with me to Cleveland along with my three children, Leo and Sarah from San Francisco and Ben from West Hartford. Their presence gave me an incalculable measure of comfort and strength. The operation was a tricky one. He then did research of his own and suggested Dr Lars Svensson. Dr. Svensson had repaired the aortic aneurysm of Boston Celtics forward Jeff Green who returned to professional basketball the following year. I figured, that if Dr. Svensson was good enough for the Celtics, he was good enough for me though my surgery was more complex. It was a tough go. My recovery was slow and painful. We had the great blessing, though of Jordan and Jeannie Tobin. They had been friends since we all lived in Columbia, Maryland. Jordan is a physician to whom I would always turn for information about the medical condition of people I visited who were ill. Jeannie had been president of our synagogue in Maryland, and subsequently has been president of both the JCC and their synagogue in Cleveland. They invited Vickie and me to stay with them at their home in Cleveland for as long as we wished after my release from the hospital. What a blessing that was! My family, Jordan and Jeannie, their daughter Cyndi, her husband Robert, their three delightful children, an uplifting visit from a former student, Jodie Urban Amiot, who drove 100 miles to see me, and Facebook messages of encouragement from around the world and every period of my life all gave me strength. Even after we returned to Connecticut the road was difficult. Several visits to a wonderful psychologist helped me immensely. I had a chance to share my feelings and begin to set a course for my future. I resolved that I would finally publish the book that had been percolating in my mind for nearly forty years. I began to work in earnest on What’s in It for Me? Finding Ourselves in Biblical Narratives. Then a great opportunity surfaced. David Ross, President of the Reform congregation in Milan, Italy, who had heard me speak at the European Union for Progressive Judaism convention in Amsterdam the previous March, invited me to be guest rabbi in Milan for three months the following year. It was a wonderful experience. At this time two amazing women entered my life, Pastor Ursula Sieg and Susan Marie Shuman. Ursula visited us in Milan and invited us to come to Germany the following year. Susan, a professional writer, took interest in my work and midwifed my book into print. What has occurred subsequently is, in my rudimentary German, wie ein Traum, like a dream. Vickie and I spent ten weeks for three years in Germany. There, thanks to Pastor Sieg and her husband, Pastor Martin Pommerening, I have had unbelievable opportunities teaching about the Shoah in high schools with Vickie and speaking and teaching in synagogues and some two-dozen Christian churches and teaching rabbinical students at the Abraham Geiger College in Berlin. I also taught a seminar on Psalms to Christian and Muslim Religious Education students. I have had the privilege of speaking on the anniversary of Kristallnacht in Leipzig, the city where my late father was arrested and imprisoned that fateful night in 1938. I conducted the first Jewish service in the city of Friedrichsstadt since World War II, and spoke words of reconciliation in a church once pastored by a man who became a Nazi officer who was tried and convicted at Nuremburg for the murder of thousands of Jews. Thanks to Pastor Sieg and her publishing company, mutualblessing edition, What’s in it for Me? is now available in German, Russian and Spanish. She also conceived and made real ToraHighlights, containing short commentaries in English and German on each weekly Torah portion. Beautiful photographs by Lena Stein from Beth Israel, the congregation of which I am Rabbi Emeritus in West Hartford Connecticut adorn the book. Ursula and Martin also travelled to Nashville to attend the dinner at which I received the award as Vanderbilt Divinity School’s Distinguished Alumnus of the year for 2017. Susan Shuman not only is responsible for the publication of What’s in it for Me? 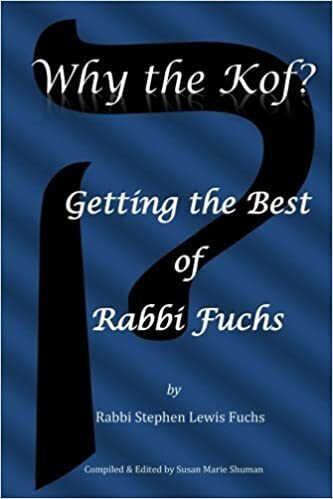 She lovingly and creatively tends my website (www.rabbifuchs.com) and has compiled and edited my last three books, Why the Kof?, Why Triple Chai?, and my forthcoming volume, Who Created God? In great measure, due to Susan and Ursula “my cup runneth over.” That is why I shall dedicate Who Created God? to them.